They take your breath away when you first see them, the hundreds of dolls lined up inside Mama Muriel’s Doll Museum in Leonard. That is the spell cast when you visit Muriel Bonds’ dolls. Even the most jaded visitors will find something that takes them back to a more carefree time. Murriel’s grandson, Jackie Bonds, can attest to that. When he noticed that work had stopped on installing glass in the museum’s cases, he found the burly workmen reliving their childhood with G.I. Joe. The museum is a wonderland for anyone, male or female, who has ever had a doll or wanted a doll. Reliving a memory is practically guaranteed. “The people who come through here, there’s always some emotional thing that will strike them,” Bonds said, speaking of the museum, which he built, and the collection amassed by his grandmother Muriel Bonds, who still visits on outings from the Leonard rest home where she lives. 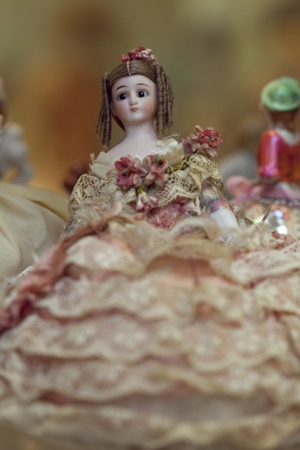 Dolls dating to the mid-1800s have found a home at Mama Murriel’s (Mama Murl to her family). The most famous doll in the world, Barbie, is here, represented in different reincarnations as she changed through the years. Her little sister Skipper and friends Ken and Midge are with her too. Chatty Cathy, Crissy dolls, Mattel’s Liddle Kiddles—dolls that have become cultural icons—are preserved at Mama Murriel’s. Also in the family are antique German and French dolls, and the collectible series dolls such as Madame Alexander, Effanbee, and American Girl. The list of residents at Mama Muriel’s includes not only the stars of dolldom, but a who’s who of names from history and the celebrity world. A selection of American First Ladies, along with Susan B. Anthony, Princess Diana, Donny and Marie Osmond, Brooke Shields, Farrah Fawcett, John Wayne, Mr. T, Groucho Marx, and Michael Jackson all have spaces in Murriel’s glass cases. Numerous Shirley Temples, complete with curls and dimples, model costumes from her movies. And Miss Scarlett O’Hara from Gone with the Wind is on hand, straight from Tara in her moss-green dress made of curtains. Sets of dolls commemorate the 1934 birth of the Canadian Dionne Quintuplets. Not all the dolls are of the cuddly playful juvenile variety. Petite porcelain ladies recline on ash tray beds, and with the slightest nudge, wave their legs in the air. The museum includes what Bonds thinks may be one of the world’s largest collections of half-dolls, a thousand tiny torsos of dainty ladies only a few inches tall. Half-dolls were dresser ornaments or lamp finials, or they topped pin cushions, ring boxes, powder puffs, barber’s brushes, or tea cozies, or they served one of a dozen other uses. Head vases, many made by the world’s finest china makers, are another subcategory of Mama Muriel’s dolls. From the world’s smallest Kewpie Doll to a Barbie doll dressed in a flamboyant Bob Mackie costume or an old china doll whose painted face is nearly worn off by a child’s hands, Mama Muriel loved them all. But if she did pick a favorite, Bonds and his mother, Lenora Moore, both agreed it would be the Terri Lee dolls. They began production in 1946 and were made into the 1960s, with some special issues and reproductions still made today. Muriel also collected the doll furniture, clothes, and accessories that are on display. Many dolls wear clothes that she made. As Bonds will tell, his grandmother wants all her dolls to be decently clothed. A “nekkid” doll currently displayed to show its jointed parts always brings dismay from Murriel when she visits. Bonds said that more than forty cases of dolls are stored because they do not have room to display them. He rotates the dolls so that every one gets its turn in the showcase. It took four months to place the dolls into the display cases. Muriel was born to sharecroppers in 1917 in Red River County, the only girl in a family of brothers and boy cousins. In a photo of her in the early 1920s, she sits with dolls gathered around her, a hint of what her future held. Her present-day collection did not begin until the mid-1960s, after her retirement from the Red River Army Depot. Muriel’s husband James encouraged her collecting and would often surprise her with dolls that she did not buy because she thought they were too expensive. 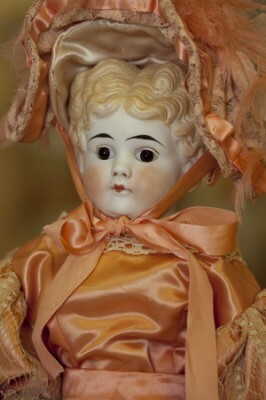 One of the most extraordinary aspects of the museum is that Muriel acquired all these dolls before the days of the Internet, locating rare and antique dolls through doll clubs and a network of fellow doll-lovers. The idea for a museum came about after James Bonds died in 1995. Muriel worried about her dolls and where they would spend their days after she was gone. Bonds reassured her that the dolls would be cared for. He talked of building a place to keep them, and then realized that she wanted the life-sized doll house built while she was still around to enjoy it. “She was so upset about what would happen to her babies,” Moore said. So Bonds built his grandmother a place to shelter and show the dolls, and to shelter her, just a holler away from his own home. After the museum’s completion, she lived in a room there until she moved to Leonard Manor. Now, if she is home for a family gathering, the others may find her roaming through the museum aisles on her scooter. Since building the museum, Bonds has had no regrets. Now others can appreciate the time and energy that Murriel spent in gathering her collection. “I understand the passion of collecting,” he said. “Sharing with others is the fun of collecting. Collections are worthless if you can’t share them.” And he sees the museum as a tribute to his grandmother as much as it is a place to house her collection. More than six hundred visitors pass through Mama Muriel’s each year. Doll clubs, groups from retirement homes, children’s groups, even people from as far away as Estonia and Sweden have come to Leonard to see the dolls. Bonds said that most are doll collectors themselves and, “They always leave happy.” And sometimes they leave something behind. Moore picked up a ragged baby doll out of a bowl just inside the museum doorway. Neither she nor Bonds knew where it came from. Someone must have left it in hopes of it finding a good home. Mama Muriel, now 92, still recognizes her family, but may quickly forget that they have visited. She remembers her dolls, even those she had as a child. And she remembers that her parents must have sacrificed to buy dolls for their little girl. Yes, Mama Muriel, you do, although thousands is more like it, and don’t worry about them. They are being well taken care of and even more, they are bringing warm memories to others. I have inherited a doll collection from my mother. many are beautiful real baby looking with porcelean faces and feet and hands, some are in original boxes some are not. Included in this collection is my original thumbelina in mint condition 60 years old. Are you a collector that buys dolls or do you know how I could sell these to a collector in the area. My mother-in-law, Lauragene was a close friend to Muriel and James. I remember visiting Muriel’s home and all her dolls. I had never seen so many dolls, and she had every doll that I had ever had or seen. It was truly amazing and such fun to visit her. She and Granny collected dolls for many years and enjoyed each other’s company. I began collecting Barbies and our son started collecting Beanie Babies at an early age. It was so fun to find out what doll Muriel could find before anybody else had it. She was a true inspiration to all.